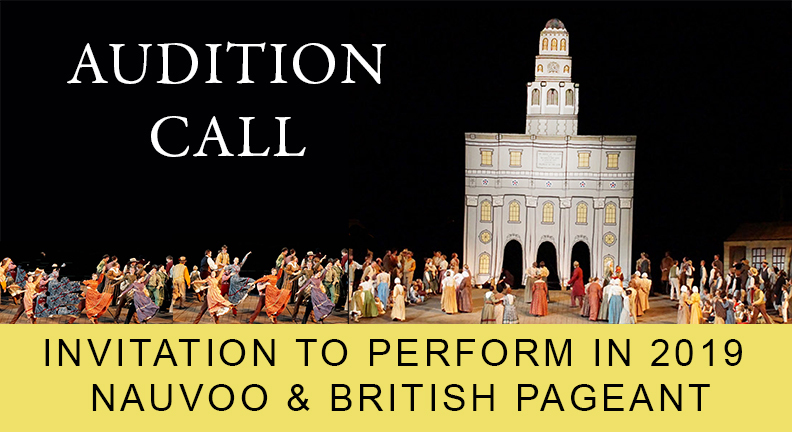 NAUVOO NEWS - The Church of Jesus Christ of Latter-day Saints is seeking professional-quality actors to audition for 21 core cast roles in the Nauvoo and British pageants, which will be performed on alternating nights in Nauvoo during the summer of 2019. The core cast auditions will be held at the end of January and beginning of February. For more information or to sign up for an audition time, visit https://www.signupgenius.com/go/60b0e4ea5ad2fa6f49-2019. For those who are not able to attend the auditions in person, please send an email to culturalarts@ldschurch.org for information about submitting a video audition. Core cast rehearsals will be held in Salt Lake City in June 2019 and will move to Nauvoo, Illinois, on June 24. Performances for both pageants will be July 9 through August 3, 2019.